Western New York evens the match in the 124th minute to force a shootout in which the Flash beat the Spirit 3-2 to win the NWSL championship. 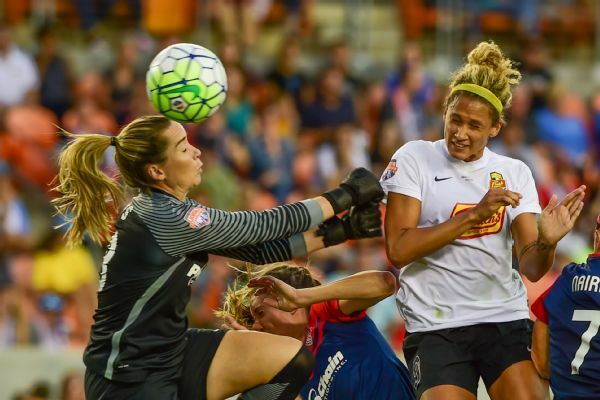 HOUSTON -- If the National Women's Soccer League finds the future to which it aspires, it might well produce greater champions than the Western New York Flash in the years ahead. 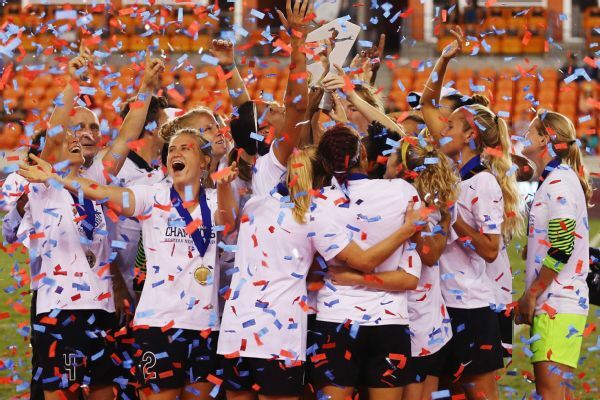 But after the Flash's improbable, barely believable, last-minute escape and penalty shootout win over the Washington Spirit, it will be impossible to produce a champion that did more to earn the confetti angels the Flash players made on the field as darkness descended in Houston. 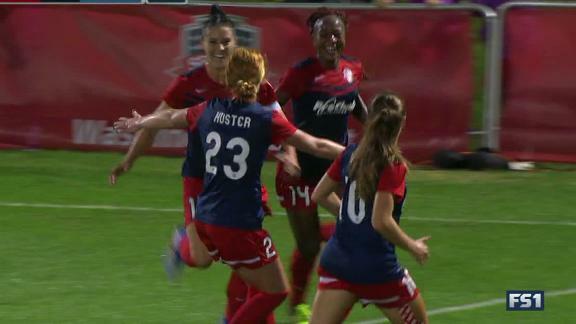 Western New York Flash forward Lynn Williams heads the ball into the goal to tie the NWSL championship game in the 124th minute. Without a coach until weeks before the opening game in April, the Flash clinched the league's final playoff berth after a win on the final day of the regular season. They then traveled the width and breadth of the country to play No. 1 seed Portland on its home field in a semifinal. There, in front of the largest crowd in the league's admittedly short postseason history, the Flash squandered a two-goal lead then built another one to match it. 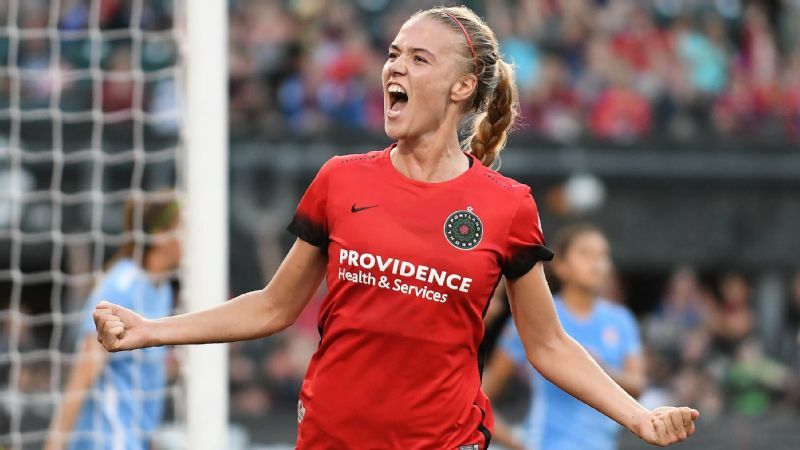 On Sunday, without the coach banished for the final because of a red card in Portland, they fell behind in regulation, then again in overtime after pulling level once. They watched the minutes tick away against the team with the second-best record in the league. They played the 30 scheduled minutes of overtime. They played the 121st minute, at the referee's discretion. And the 122nd minute. And the 123rd minute. Finally, Lynn Williams rose to meet a cross and headed home the tying goal in the 124th minute to force the deciding penalty shootout. "People talk about teams of destiny," Western New York coach Paul Riley said. "This was a team of destiny, for sure." The better team on the day? Washington players and coaches didn't think so -- not that the sentiment stirred much controversy. Western New York players and coaches agreed with the assessment. It wasn't a particularly compelling game for long stretches of regulation, but what compelling play there was came mostly from a Spirit team that built possession and harassed the Flash's back line. A deserving champion? How could a team travel a road more deserving of reward? 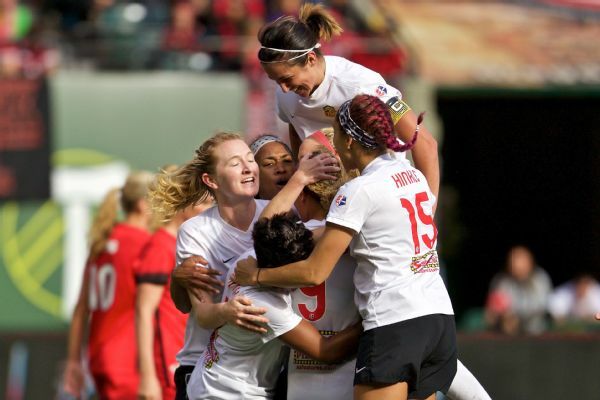 After upsetting Portland in the semifinals and rallying in the final against Washington, the Flash celebrated their improbable NWSL championship. Washington did everything possible to win the game. Rather than play the Flash on their favored terms, as Portland tried and failed a week earlier, Spirit coach Jim Gabarra adjusted to match the underdog. For the first time all season, he started neither Joanna Lohman nor Diana Matheson, two valuable veteran midfielders. He instead started three center backs, playing with a back three and pushing normal outside backs Ali Krieger and Caprice Dydasco (until Dydasco suffered a knee injury and was replaced by Alyssa Kleiner) forward in a 3-5-2. Although he said it was a secondary look the team had worked on for a long time, it was a bold roll of the dice to break out for the first extended look in the championship game. And it worked. "For large majorities in the game, they were very ineffective in the attack," Gabarra said. Again, he got little argument from those on the other side. 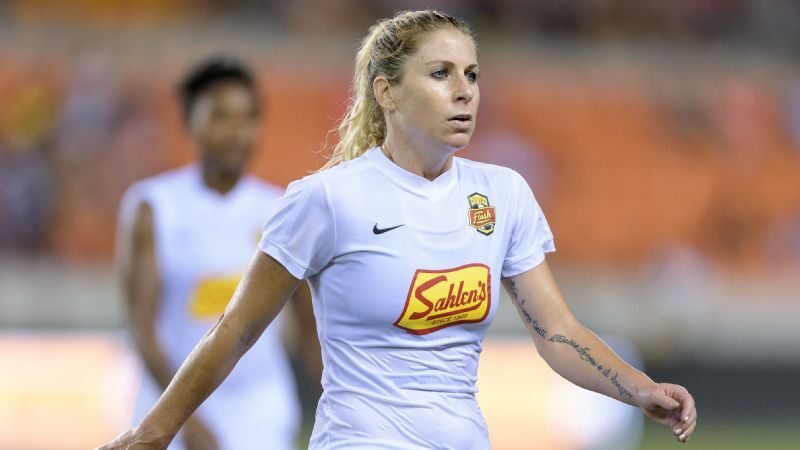 With three center backs, the Spirit had a numerical advantage on Williams and Jessica McDonald, the Western New York forwards who so tormented regular-season champion Portland a week earlier. With more possession, the Spirit also outnumbered the Flash in midfield for at least the first half. The Flash weren't brilliant on the day. 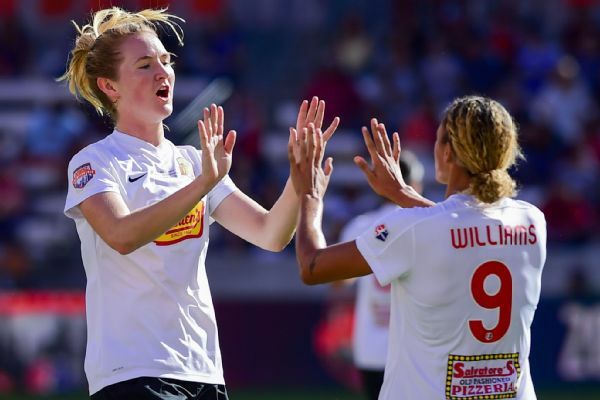 They got an early bolt of brilliance when Sam Mewis leveled the game at 1-1 shortly after Crystal Dunn put the Spirit in front in the first half. They got the late miracle equalizer from Williams. They got three saves from goalkeeper Sabrina D'Angelo in the shootout -- enough to make Williams' penalty kick the clincher. It wasn't a great overall performance. The brilliant bit was being on the field in the first place. The Flash flew home from Portland on a Sunday redeye and put their bags down at home mid-morning Monday. They trained in Buffalo on Tuesday, then left for Houston the next day. They watched the sunset in three time zones in four days and traveled more than 4,000 miles -- nearly 7,000 in less than a week, if you count the trip to Portland before the semifinal. "That's the nature of this league because the country is so big," McCall Zerboni said. "When you look at the leagues in Europe and stuff, they don't travel as much. They don't travel those distances. That's the way the cookie crumbles. "But again, the will of this team, nothing is going to slow us down." Plenty slowed them down a season earlier. Although not the league's worst team in 2015, the Flash missed the playoffs by a proverbial mile and were every bit as discordant as might be imagined, as they conceded 10 more goals than they scored. A veteran who had a rocky tenure under the weight of high expectations in Portland, Riley was perfectly suited in time and place to again become the underdog. From the minor details of food and improved travel from the team's Buffalo base to its home venue in sort-of-nearby Rochester to the skill development of rising stars such as Williams, Mewis, Abby Dahlkemper and Jaelene Hinkle, it worked. "As soon as Paul came in, he's such a player's coach and was really just all for us," Dahlkemper said. "He listened to us. He fixed the things that needed to be fixed in order to be in this situation. Even off the field, players were together. We love each other, and you can just tell the union off the field translates straight on. We just believe in each other." So it was that a team that made such use of McDonald's long throw-in during the postseason saw its season hinge on a short throw to McDonald from Hinkle in the final minute of overtime -- no time for anything but that. With space all around her, a rare positional lapse from the Spirit, McDonald curled in a high arcing cross toward the back post. Rising between two defenders at the other end of the arc, goalkeeper Kelsey Wys made the decision to come meet the ball. Williams said it was a "now or never" moment. That led to an understandable thought when she saw the ball make its way into the goal. Holy crap, I scored. Then came the realization of just how late the Flash left it. Western New York's Samantha Mewis (left) scored in the first half to tie the game 1-1. "First, I was like, 'Let's go get another one,'" Williams said. "Then I realized, unless we get one of those crazy, two-second goals, it's probably not going to happen for us. So prepare for PKs." As was the case a week earlier in Portland, the result left the possibility of one result overshadowing a season's worth of success. In this case, the result was officially a draw and not even a loss. 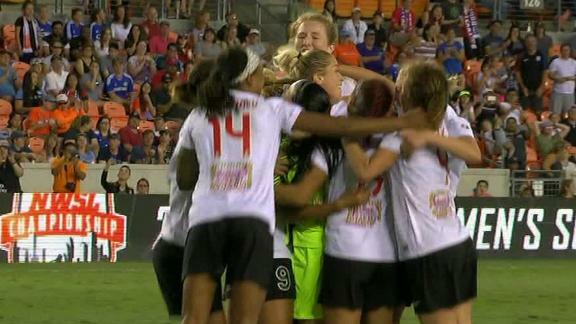 The final seconds and ensuing penalty shootout certainly left Crystal Dunn unjustly in the shadows after she scored two goals. In very nearly adding an NWSL title to the U-20 World Cup and NCAA titles she earlier claimed, Dunn played like the player Williams displaced as MVP. After a regular season in which she scored just two goals, willingly taking on a different role that Gabarra said he hoped would continue her evolution into one of the best players in the world, it was sweet redemption. Until it turned bittersweet in the blink of an eye in the 124th minute. As strange as it sounds for one of the most improbable escapes from the most improbable of finalists, those confetti angels were everything the Flash deserved.